Zagreb and Bilgi universities are involved in an EU initiative to improve access to legal advice in the Western Balkans and Turkey. 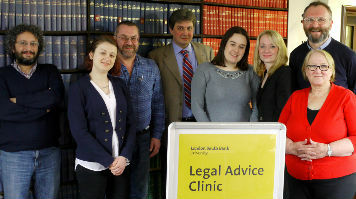 Representatives from the two institutions came to LSBU to get a better understanding of how the university's pioneering drop-in legal advice service works, with a view to using the LSBU model as a template for their own projects. The LSBU Legal Advice Clinic is a free drop-in face-to-face legal advice service in which 2nd and 3rd year law students interview and advise real clients, under the close supervision of university-employed practising solicitors. In addition to providing a valuable service to the local community, the Clinic provides law students with a unique opportunity to gain real world legal experience. Alan Russell, Senior Lecturer at LSBU and Director of the Legal Advice Clinic said: "The EU's initiative in the Western Balkans and Turkey is an excellent one. It's testament to the innovative and ground-breaking nature of the Clinic that colleagues in Turkey and Croatia are here to see how we run it with a view to using our model as a template for their own projects"